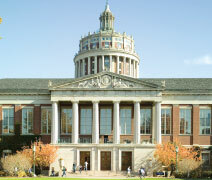 If you’re thinking about studying business, Rochester may be the place for you. With the resources of the world-renowned Simon Business School and the adaptable undergraduate Business program, you’ll explore a challenging curriculum on your own terms. You’ll develop extraordinary quantitative and analytical skills that challenge MBA students elsewhere. Type of School:The University of Rochester, founded in 1850, is a private, coeducational research university that occupies a 90-acre residential campus (River Campus) in Rochester, New York. Enrollment: 6,390 undergraduates; 50% male, 50% female; 17% are historically underrepresented minority students; 27% are international. As a Business major, you’ll pursue a challenging core sequence in finance, accounting, marketing, operations management, and organization theory while building on principles of statistics and economics. The program offers tracks in Finance, Accounting, Marketing, Business Analytics, and Entrepreneurship. You’ll enjoy the flexibility of the Rochester Curriculum, including the freedom to double-major or pursue a self-designed program. In the end, you’ll have a legitimate, strong liberal arts degree and the confidence to take that next step into the business world or graduate studies. At the University of Rochester, we do just that. And so do our students. The innovative Rochester Curriculum is driven by you. Personal choice and curiosity determine your future. The Rochester Curriculum is flexible and reflects the true hallmarks of university life and learning: curiosity, competence, and community. There are no required subjects. Based on your unique interests and goals, you build your own education and learn what you love. The University is a community where more than 90% of undergraduates live on campus. With more than 250 student organizations—ranging from cultural and political to religious and athletic—you’ll find communities of friends who share your interests and passions. With Lake Ontario on its northern border, the scenic Finger Lakes to the south, and more than a million people, Rochester is rated among the most livable cities in the United States. The city of Rochester is a dynamic mix of culture, commerce, and history. Cultural and recreational opportunities include museums, parks, orchestras, planetariums, theater companies, and professional sports teams. 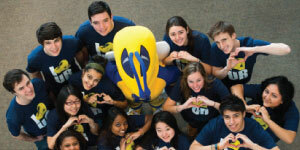 Rochester students get the support they need—from faculty, staff, and one another. Counselors in the Career & Internship Center are available every step of the way, helping students articulate their goals, assisting with internship and job placements, and inspiring academic and career exploration. Information and support are also available from the College Center for Advising Services, the Financial Aid Office, the Office of Minority Student Affairs, and the International Services Office. Undergraduates receive an extraordinarily strong education in their chosen fields. Additionally, Rochester offers many options beyond traditional course work. Opportunities that allow our students to explore their individual interests further include Professional Degree Programs, Dual-Degree Programs, Research and Innovation Grants, Kauffman Entrepreneurial Year, Take Five Scholars Program, private lessons at the Eastman School of Music, study abroad, and undergraduate research. The University of Rochester seeks to admit students who will take advantage of its resources, be strongly motivated to do their best, and contribute to the life of the University community. An applicant’s character, extracurricular activities, job experience, academic accomplishments, and career goals are considered. There are no minimum requirements for admission. Each student’s application is reviewed using a committee process that entails a comprehensive evaluation of each candidate. The typical Rochester student ranks in the top 10% of his or her high school class, has taken two to seven AP or IB courses, has maintained a median academic unweighted GPA of 3.8, and has submitted an SAT score between 1240–1450 or an ACT score between 29–33.